Dr. Matt Gould (B.M. Peabody Conservatory, M.M. University of Arizona, and D.M.A. Arizona State University) is Director of Guitar Studies at Cambrian College in Sudbury, Ontario Canada, and a former Assistant Professor at Eastern Mediterranean University, Faculty Associate at Arizona State University, sabbatical leave professor at University of Memphis, instructor at Paradise Valley Community College in Phoenix, Arizona. 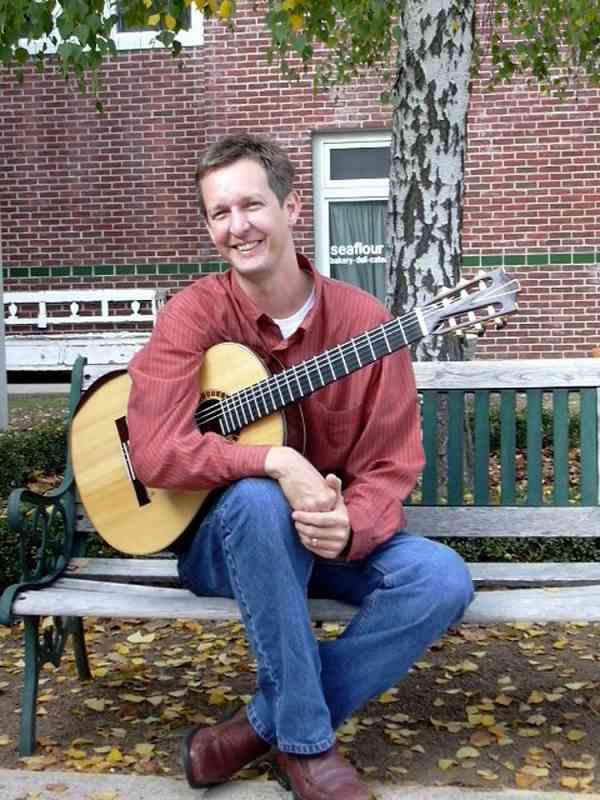 Classical guitarist Matt Gould (BM Peabody Conservatory, MM University of Arizona, DMA Arizona State University) has been described by former teacher Manuel Barrueco, as “a guitarist capable of giving performances of great beauty, enthusiasm and control.” He is active as a performer, scholar and teacher. As a performer, Dr. Gould concertizes internationally with Duo46 (Guitar with Beth Ilana Schneider-Gould, violin), the Strung Out Trio (Duo46 with Nathanael May, Piano) and B.A.M. (Duo46 and Avi Avital, Mandolin). As artists living in the 21st-century, Duo46 embraces music by living composers, and as champions of contemporary art music, their recordings often celebrate new chamber music for guitar, most often composed specifically for them. Their intriguing mix of music depicts the impressions and experiences of composers past and present, capturing an array of style and emotion with literally hundreds of works for violin and guitar duo including Double Concertos and Trios with Cello (Cyprus Trio), Mandolin (B.A.M. ), Piano (the Strung Out Trio), and Viola (The None Trio). Performance highlights include concerts in Austria, Canada, Chile, Cyprus, England, Germany, Greece, Italy, The Netherlands, Turkey and throughout the United States with notable appearances at the Entrecuerdas Guitar Festival, Guitar Foundation of America Festival, Hermopoulis International Guitar Festival, Cortona Contemporary Music Festival, New York Guitar Seminar, and Soundscape Music Festival. Distinguished ensemble residency work includes Harvard, Florida State University, UC Berkeley, Hochschule for Musik in Wurzburg, Germany, the Society of Student Composers, Inc., Cincinnati Conservatory of Music and the American Composers Forum. Other career high points include two Barlow Commissioning Grants, ENCORE Performance Grant, touring sponsorship from the U.S. Embassy, a showcase ensemble for Chamber Music America, and appearances at Kennedy Center and Herbst Theatre. Awards and honors include a Hos Award from the Peabody guitar faculty upon graduation, a Barlow Commissioning Grant for “Fancywork” by American composer Geoffrey Gordon, a Canadian Broadcasting Corporation Radio 2 Commissioning Grant for “On Freedom,” an electro-acoustic work for Violin and Guitar by John Oliver, an ENCORE Performance Grant for repeat performances of “Trigger” by John Mayrose, and a Feline Shouse Chamber Music Fellowship to attend the Great Lakes Chamber Music festival sharing the stage with new music specialist Gil Kalish, the first lady of American piano, Ruth Laredo, and the St. Lawrence String Quartet; and studying chamber music with legendary musicians Henry Meyer (LaSalle String Quartet), Paul Katz (Cleveland String Quartet), and Philip Setzer (Emerson String Quartet). Dr. Gould has presented papers on Composing for the Guitar at University of California Berkeley, California State University Fresno, and Harvard, and Chamber Music with Guitar at the 2007 Guitar Foundation of America, Los Angeles. In the field of music theory, “Ex Tempore” (West Springfield, Massachusetts) published Dr. Gould’s analysis of “Toward the SEA” for alto-flute and guitar by Toru Takemitsu. Current pedagogical projects involve the development of a Classroom Guitar Method Book and online guitar courses including Fingerboard Harmony and Classroom Guitar. Dr. Gould’s latest activities involve the publication of “Aires de Sefarad” by Jorge Liderman in the “Duo46 Collection” with Les Publcation D’Oz. This work is a collection of forty-six Sefardic melodies arranged for Guitar and Violin made possible in part by the Guggenheim Foundation. Prior to working and living in Arizona, Dr. Gould established the first classical guitar program on the island of Cyprus at Eastern Mediterranean University and, for five years, directed the guitar area. While at EMU, Matt organized a visiting composer residency, organized the first guitar competition on the island, and coached the championship American Football team; part of the Turkish American Football League (TAFL).